Queen Esther became the wife of King Ahasuerus when the king became unhappy with his previous queen, Vashti. He commanded all the beautiful young women in this kingdom to be brought to the palace, that he might see them, and choose one from among them and make her queen. Many young women came to the palace, but the Bible tells about only one of them--Esther. She was a Jew who had been carried captive with her family to Babylon, with Jehoiachin, many years before. Both her parents had died, and her older cousin, Mordecai, took her in and raised her. Esther grew up to be a very beautiful girl, so when the king commanded all the young women to be brought to the palace, Mordecai sent Esther with them. No one at the palace knew that Esther was a Jew; Mordecai had thought it best to keep that a secret. When the young women were brought before the king, he liked Esther the best and chose her for his queen. So he took the crown and put it upon her head and held a great feast to celebrate. 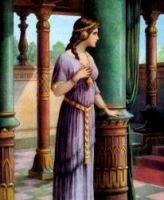 These pictures of Queen Esther are drawn from a number of bible story books. Feel free to use these Queen Esther pictures in your projects. Click on the drawings below to see more details about saving a free image or about purchasing an image of Queen Esther at a higher resolution.